Though I’m not 100% sure what causes this to happen, on some versions of Premiere Pro on some versions of Windows, AVCHD files inserted into the timeline don’t include audio. For example, audio is included with Premiere Pro 2018 running on Windows 10 computers but isn’t on Premiere Pro 2017 running on Windows 10 computers, or on Premiere Pro 2018 running on Windows 7 computers. You end up with a lonely video file like that shown in Figure 1 below. I’ve read that it relates to the Dolby Digital audio stored with the video, but whatever the cause on whatever the system, FFmpeg supplies a simple workaround. Figure 1. No audio came in with the AVCHD file. Specifically, you use FFmpeg to convert the Dolby Digital audio included with the AVCHD video to the Apple Lossless codec, and import that instead. Here’s the command string. -i – designates the input file. Substitute your file here. -vn – tells FFmpeg not to include video in the file (we just want audio). -acodec alac – tells FFmpeg to output the audio in the Apple lossless format. – flac4.,m4a – tells FFmpeg to package the file using the .m4a container format. Here’s FFmpeg processing the file on my HP ZBook notebook, which is occurring at 42x real time. Figure 2. FFmpeg processing at 42x real time on my HP notebook. Once complete, you import the file into Premiere Pro as normal and drag the audio to the timeline. Figure 3. The new audio file added to the timeline. Obviously, you want to check for synchronization, particularly on longer video files, but on this ten-minute file, sync was fine. Easy, peasy, on with your editing. Want to Learn More about FFmpeg? I’m not sure how many Premiere Pro editors use FFmpeg, but it’s become essential for me since learning how to use it back in 2016. 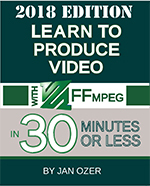 If you’re looking for a fast and easy way to learn FFmpeg, check out the 2018 Edition of my book, Learn to Produce Video with FFmpeg in 30 Minutes or Less. This edition updates the book to FFmpeg 4.0, and includes. The update costs $34.95 in print (available around August 1, 2018) and $29.95 for a downloadable PDF which is available now. Click here for more information on the book.